Aren't they cool? 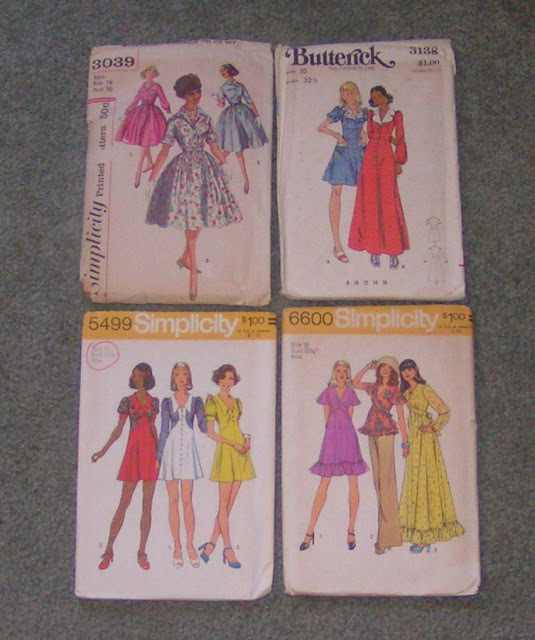 Three of them, the 70s ones, are too small for me so lots of tracing and adjusting will be required. I suppose I should finish getting my sewing area cleaned out and set up. The Butterick dress reminds me of something Sarah Jane would have worn during her adventures with the Fourth Doctor. I tried to look for some of her outfits but got teary-eyed knowing that the current Doctor won't get to have an adventure with her. Wouldn't they be great together? That's all for today. I'll be back soon, maybe even with something good to share. Have a lovely week! Here's to a new new month. I hope it's a million times better for you. I'm so sorry I missed this post Bobbi, what a horrid way for the year to start. Mine stArted pretty roughly too with wisdom tooth infection and having to move house unexpectedly but at least it was mostly to do with me!